Heinz-Dietrich Suppan, a native of Springfield, Illinois received his Associate of Arts degree at Springfield Junior College, a Bachelor of Arts in History and German at Illinois College in Jacksonville and a Master’s Degree at the University of Illinois in Springfield. He has authored three books that dealt with Illinois History. Remember Indian Creek! In the Shadow of the Black hawk War, Marking Time: The Radium Girls of Ottawa, and Pana: The Crossroads of Crisis. Suppan continues to teach German and several history classes at Marquette Academy in Ottawa and also serves as an adjunct instructor at Illinois Valley Community College. He had given several presentations at the annual Conference on Illinois History in Springfield. Suppan lives with his wife Leslie in Ottawa. 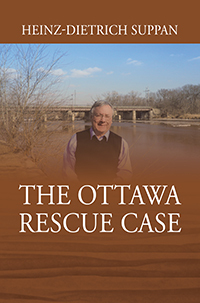 What was the Ottawa Rescue Case? The Underground Railroad that was organized to help runaway slaves seek freedom was nothing new to many residents who lived in Ottawa, Illinois in the 1850s. Several residents had established shelters for runaway slaves although they faced possible confrontations with slave catchers, law enforcement officers and trials that could lead to imprisonment and forfeiture of private property. The Northern District of the Illinois State Supreme Court became the scene of a hearing of a runaway slave Jim Gray who had been arrested in Union County in southern Illinois. The state court ruled that Gray was free of any state charges but he would have to be remanded to the U.S. Commissioner in Springfield who would have to hold a trial for Gray because of the federal fugitive slave law and would probably have to return Gray to his master in Missouri. Several citizens in Ottawa orchestrated a daring plan to free Gray while he was in the LaSalle County Court house and connect him with a nearby Underground Railroad network that would get him to Chicago and on north by ship to Canada. Several prominent citizens who participated in the escape plan were arrested and charged with violation of the federal fugitive slave law and were taken to Chicago to stand trial in federal court. The outcome of this trial surprised the defendants and shocked those who opposed the abolitionists and supported states’ rights that guaranteed slavery.